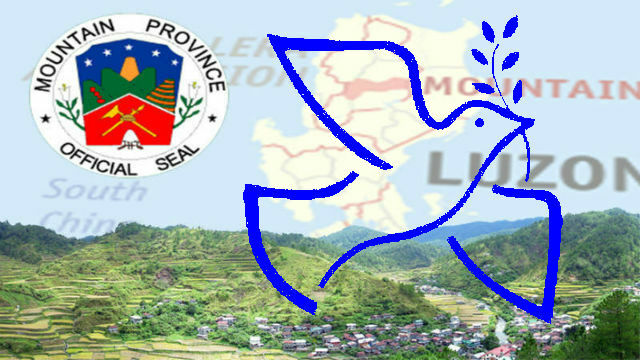 BONTOC, Mountain Province – Provincial and municipal officials underscored that the whole province remains peaceful and orderly admits the recent hostilities between government forces and members of the New Peoples Army (NPA) operating in the Ilocos-Cordillera regions over the past several days. Gov. Bonifacio Lacwasan, Jr. said that the provincial and municipal governments do not tolerate the presence of armed men, aside from the police and military, who attempt to disrupt the prevailing decent peace and order situation in the province but the province remains part of the route of the NPAs in going to the different regions where they operate. “We hope that the recent hostilities involved our government forces and communist rebels will not be repeated in any part of the province because we still believe in peace as the catalyst of development in our province. We also hope that our brothers and sisters in the communist movement will not attempt to ruin the gains of our peace initiatives because we want our province to progress,” Lacwasan stressed. Bauko Mayor Abraham B. Akilit agreed to Lacwasan’s contention, saying that it is just unfortunate that there was the use of an improvised explosive device (IED) that inflicted casualties on the side of the government troops which should have not been the case because the use of land mines are actually prohibited in international agreements that are also being used by the communist rebels in their propaganda. Akilit remains optimistic that the recent hostilities between the government forces and communist rebels will not significantly affect the town’s and province’s tourism industry because tourism has been identified by the local governments as their primary source of economic activities that will trigger environmentally-friendly development in the different communities. Mayor Akilit claimed that local growth initiatives and interventions were significantly affected by the recent armed hostilities between the government forces and the communist rebels but asserted that such incidents should not be used to ruin the gains of the municipal governments in terms of advancing peace and order in their areas of jurisdiction. Last March 28, 2019, a policeman was killed while another law enforcer was injured when members of the Regional Mobile Force Battalion engaged some heavily armed NPA rebles in a 15-minute running gun battle at sitio Malabagan, Bagnen Proper, Bauko town. In the afternoon of March 31, 2019, the ongoing hot pursuit operation by government forces resulted in another running gun battle between the pursuing troops and the fleeing rebels in Bagnen Proper. On April 2, 2019, another law enforcer died while eight of his companions were injured when they were hit by an IED that exploded while they were conducting hot pursuit operations against the fleeing rebels in the border of Tadian and Bauko towns. Mayor Akilit appealed to the police and military to make sure that the area will be cleared from the presence of IEDs that were left by the rebels to avoid civilians from being victims of such questionable act on the part of the rebels.